At Last....Brand New Website Has Gone Live! The deed is done, the switch has been flicked ....the old website is no longer and the brand new KT Miniatures website is up and running! Phew......not without a few hiccups though. It is quite different in format from the last website but fingers crossed, this will be easier to navigate, more compatible with iPads and mobiles.....plus generally is more streamlined. Have already heard from a very excited iPad customer this morning that the links work....whey hey!!! 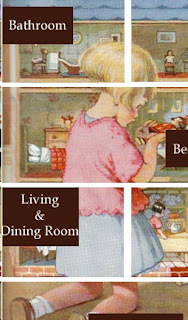 However she canot view the lower right hand sidebar on any of the pages. Well......there should be two boxed links...one to this KT Miniatures Journal and one to our workshops. All she is seeing is a little grey box. So....for the time being, until I can figure out what can be done about that, there are extra links to those up on the top navigation bar. So iPad users won't be missing out on anything....hopefully. Is better than not being able to access any of the links, which is what iPad users were having to put up with before. 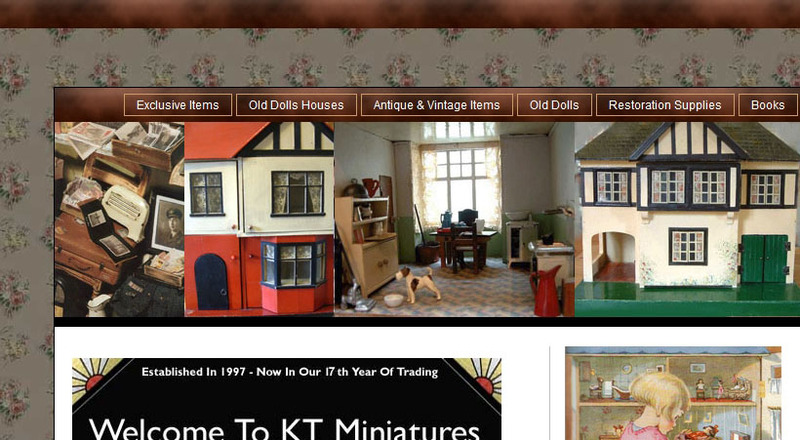 KT Miniatures New Website To Go Live Tomorrow! Just a quick message to let you know that KT Miniatures is closed for business today.....as the final touches are being put to my brand new website in preparation for the BIG changeover tomorrow!!! At some point tomorrow, the site may go down as the changeover gets underway so please don't be alarmed. Am a teency tad nervous to say the least though as am hoping that all Gremlins will stay away. It has been a bit of journey all this but fingers crossed, all will be revealed tomorrow and that at last, KT Miniatures new website will accomplish it's aim and be more mobile & iPad compatible. Have been working solidly these past few days on one final push to get my brand new KT Miniatures website up and running. Fingers crossed, this coming Friday (UK time) I hope to press the "live" button...and all will be unveiled! I have completely streamlined the whole set up so should be much more simple to use and of course.....it should be completely compatible for mobiles and iPads too, which sadly my current website is not and is the main reason for me changing over. Have also used this as an opportunity to make decisions on the services I have to offer and after much deliberating, for several reasons have decided to discontinue making room boxes to commission. Although I love doing them, they are so time consuming and becoming less viable these days but I hope to offer an occasional quirky set scene for sale now and then. Fashion Show- In Aid Of Breast Cancer Campaign....Am spreading the word! As you know, for many years now I have been an ardent supporter of Breast Cancer Campaign and am always happy to promote fundraising for this charity. Well....a lovely lady called Elaine Parish, who I met when she came to collect her little raffle prize won at the Thame Dolls House Fair back in February this year, has got in touch to tell me that her daughter is organising a fundraising event for Breast Cancer Campaign. I felt that it was the least I could do to tell the world about this wonderful event on here, particularly as Elaine is fighting the disease herself! So ladies...if you live in the Oxfordshire/Buckinghamshire area or fancy a day out to this part of the world, please see details below. Tickets £5.00 which includes discount voucher, glass of Pimms and canapes! I would like to wish Elaine and her daughter the very best of luck with this event and hope they are able to raise lots for the charity. 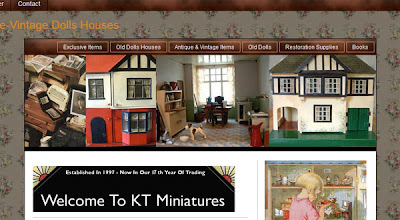 New KT Miniatures Website....Work In Progress! 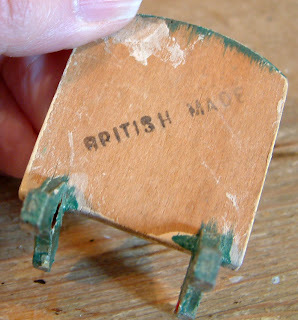 I'll be a little quiet over the next few days....as am in the middle of creating a brand new website for KT Miniatures. It's coming together nicely, although there have been one or two hiccups! Luckily though, my IT Director...aka Mr KT Miniatures, has been hovering in the background to ensure that I press the right buttons! Am actually quite enjoying it as I suppose it's quite a creative exercise.....but will be glad when it's complete as already my eyes are going rather Googly! 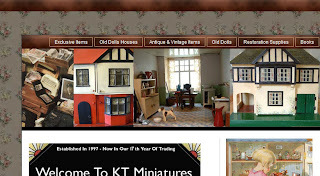 There is a great necessity for a new website as my current one is deemed old technology..... consequently some of you who try to view KT Miniatures website via iPads and certain mobiles cannot get many of the links to work. Fingers crossed, the new one will be far more iPad and mobile compatible!! A lot of research and thought has gone into this new much sleeker template. 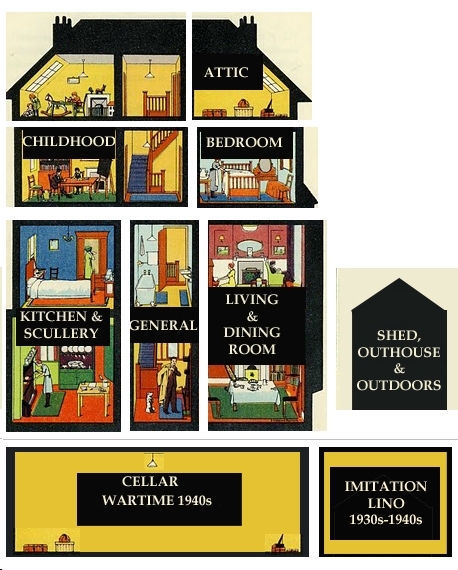 Although it is quite different in format, I have tried to incorporate some original features in order to help give viewing customers a feeling of familiarity. For now, the normal website will be visible and you can still order in the usual way so don't worry. But am hopeful that at some point next week, the new one will be able to go live. 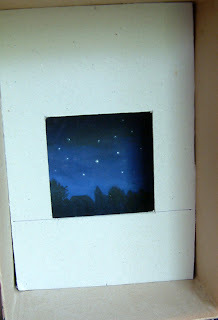 I've been much inspired to get on with this little cardboard box project-this is not a commission but a project for our local Thame club, made simply out of a cardboard box and "bits" that I had lying around. If you wish to see how I got to this point, please click here for Part One and Part Two. 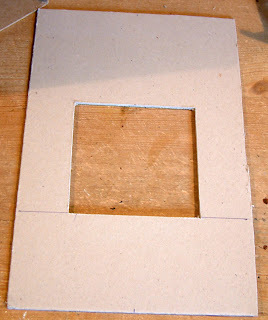 It is so easy and such a cheap project to construct. 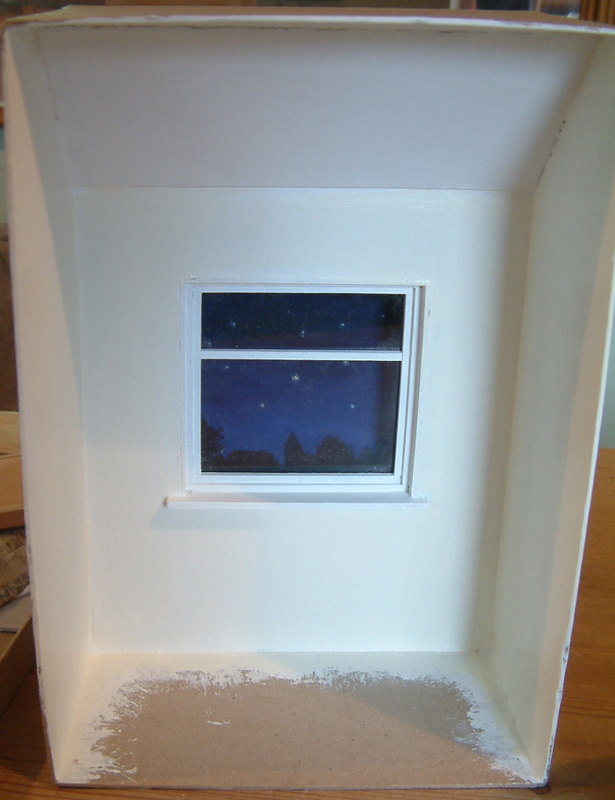 It is now progressing nicely from when you last saw it...the window and ceiling up to this point are in and walls fully painted. As promised, I have more photos to show you of the next few stages and hope that you may find it inspiring too. 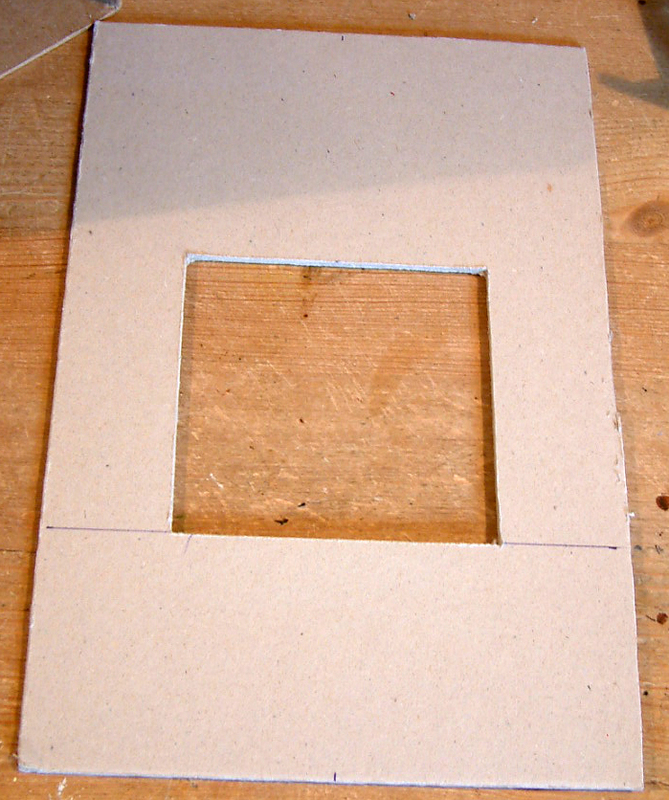 Some mount board was sliced up in approx. 1/2"strips with scissors rather than a craft knife, as I wanted a slightly random and uneven look. A coat of burnt umber acrylic paint was applied first before they were glued into place. Then two coats of raw umber were applied over the top, slightly sanded when dry and finally a light touch of white was dry brushed over the top. 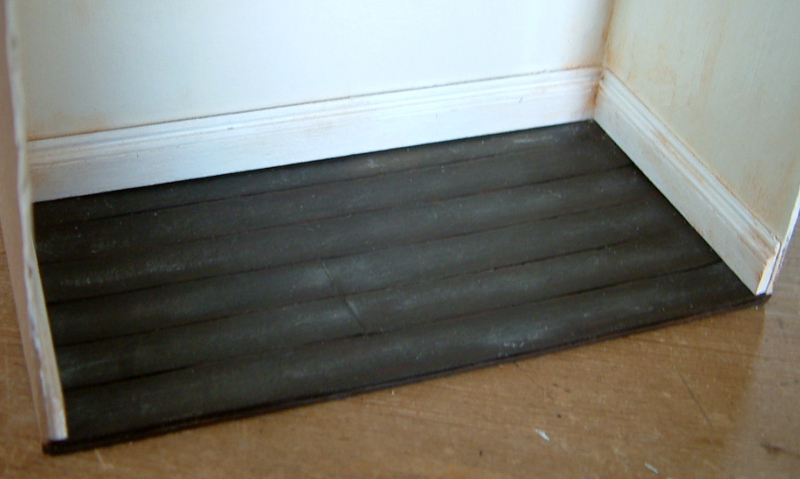 Some offcuts of skirting board was cut to fit, painted white then glued in place. 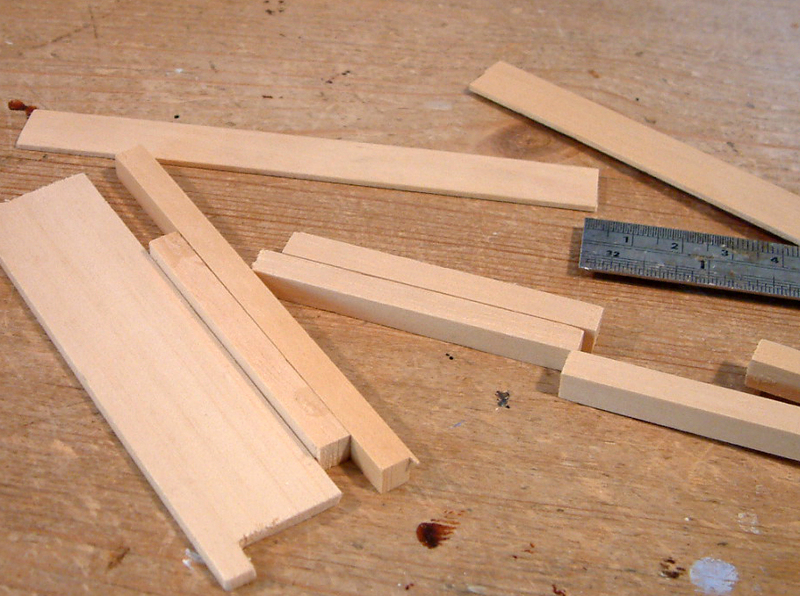 Two of the strips were cut to create extra interest...some nail heads with a sharp pencil will be added shortly to the ends of those cut planks. You probably know by now that I'm most definitely not into completely pristine, neat and tidy scenes....I prefer more realistic and lived in scenes...so just had to add a little burnt umber to corners and random patches to gently give a hint of aging. Am very pleased with the result. 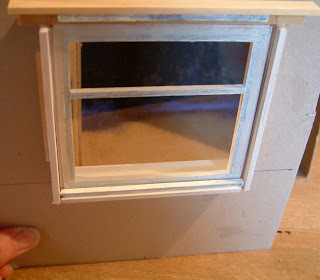 To finish the top window, a very thin inner frame was created from 1/16" x 1/16" beading, painted white then fitted into place. 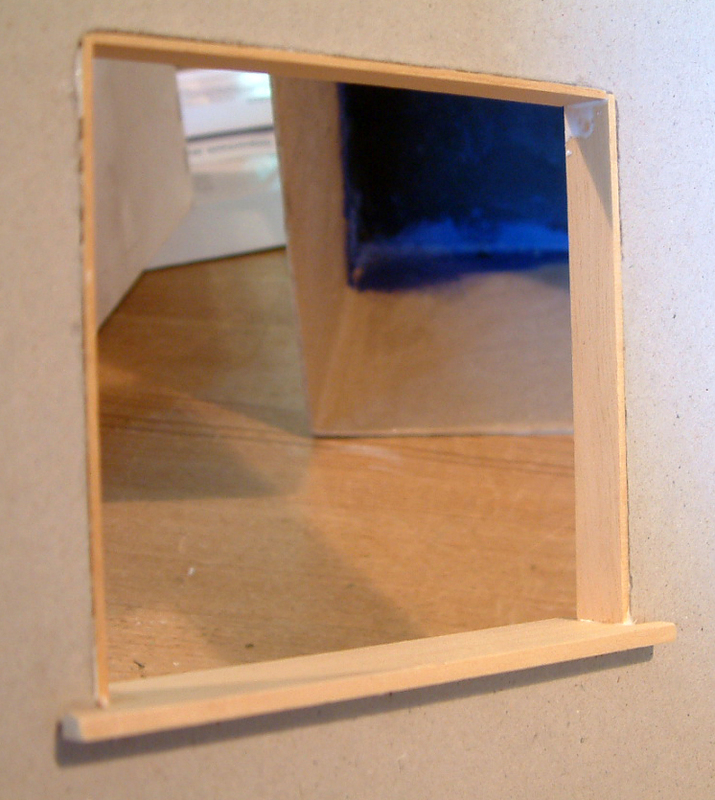 A little window casement fastener (window prop) was made from a sliced up freezer bag strip, painted, curled at one end then glued into place. 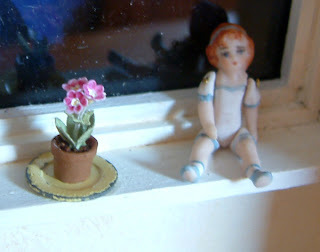 I thoroughly enjoyed my visit to Kensington Dolls House Festival last Sunday and purchased two weeny toy dolls house dolls by Canadian artisan Janice Crawley and an exquisite auricula plant off the very talented Jan Southerton of "The Flower Lady." The plant was glued to a very old metal Dol-Toi plate and fixed centrally onto the window sill. The larger of the two dolls was glued onto the window sill too so that she can sit and survey her kingdom! 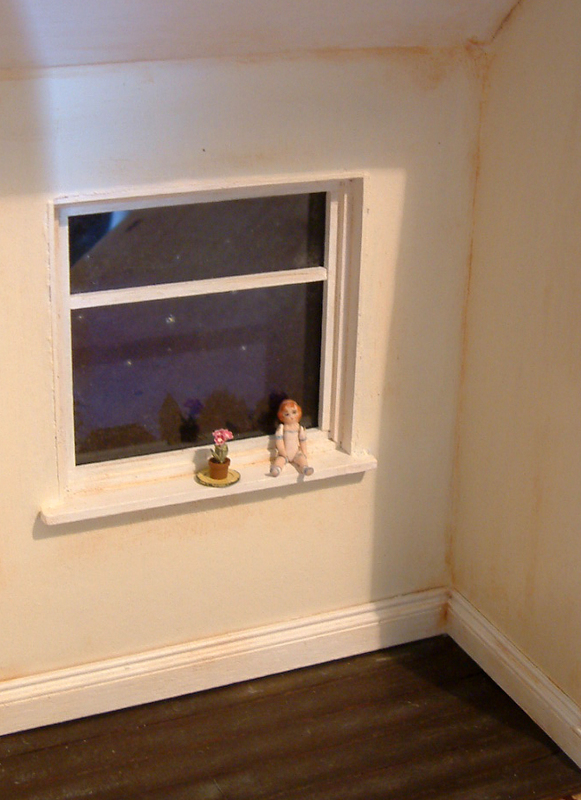 The naked baby doll is not featured in the photos but hope to have her dressed somehow by the time this project is complete! My great mate Robin Britton of Coombe Crafts, who also belongs to our local club, has taken a keen interest in my little box and has made me a wonderful little girl complete with black bobbed hair in pink pyjamas (hmm-wonder who that was based on)lol! 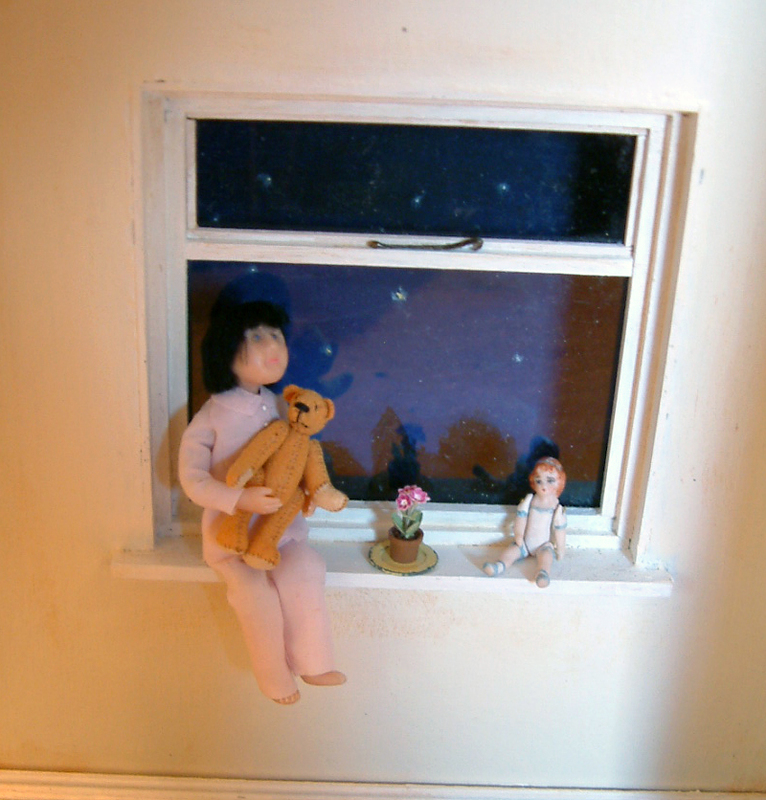 The little jointed teddy was another find at Kensington Fair made by artisan, Pat Kay. The little girl wanted to sit up on the window sill to show "Big Ted" the twinkly starry night sky! I completely succumbed to this particular teddy as he is a complete replica of my Big Ted that I had as a child and I love it! 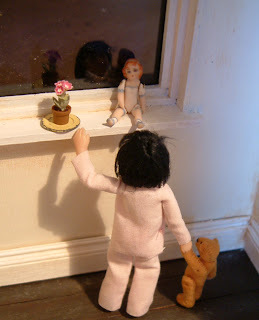 Robin's dolls are created in such a way that they are completely flexible and poseable. 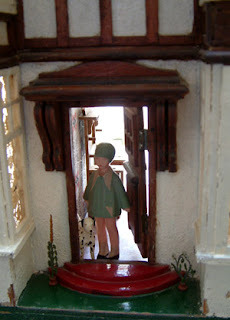 Robin always puts such character into her little creations. The little girl is no exception and is such a fidget....she has now jumped down and is now introducing Big Ted to Miss Dolly. 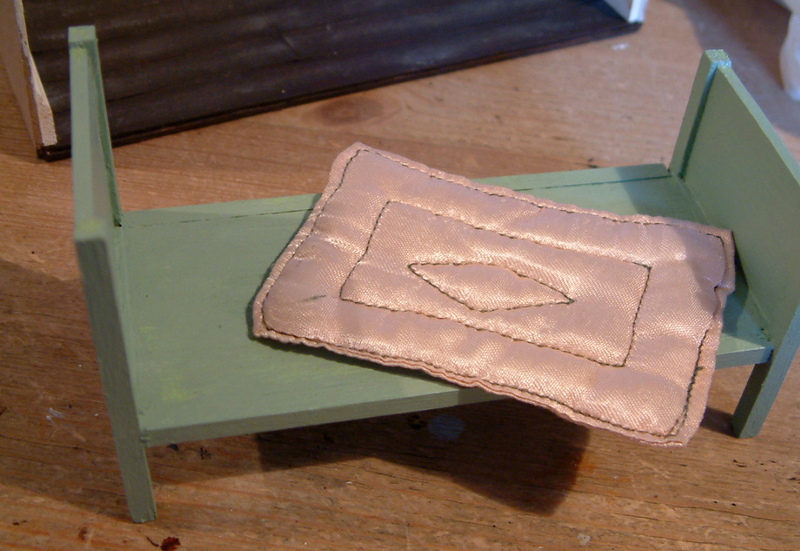 I have made a small nursery bed from wood scraps that I had lying around and painted it in pale green....the plan is to make bedding, topped with this pretty vintage Dol-Toi eiderdown from Marion Osborne's Collection. But that is well and truly it for now. Hope you have enjoyed taking a peek as much as I have enjoyed constructing this little "Twinkle Twinkle Little Star Room Box"! I will feature it on here one last time when it is complete. However that may be a while from now as I am in the throes of creating a brand new KT Miniatures website....hopefully one that will be more mobile and iPad friendly! 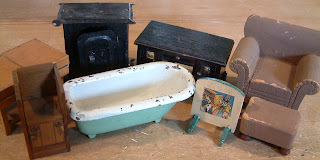 Amongst some of the more unusual antique items that went up for sale this afternoon on KT Miniatures website, is a wonderful solid cast iron bath....it weighs an absolute ton! It is very old and curiously it is marked DOLIBATH underneath. If anyone has any information about this manufacturer I would love to hear about it. This bath, as you can see, has some wear to the paintwork but in my opinion it simply adds to the character. 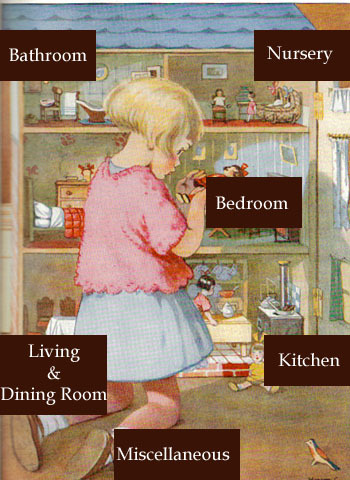 This can be found on the Antique 1/12th Bathroom Page. 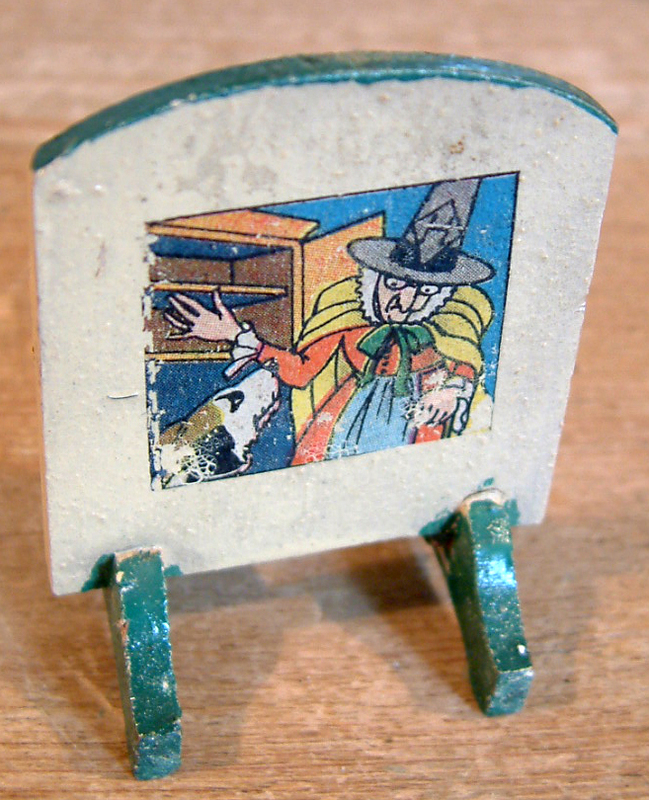 Then there is this rather lovely wooden firescreen with an Old Mother Hubbard Who Went To Her Cupboard fame motif on the front! On the reverse it is stamped BRITISH MADE. I am not sure of the exact age or make but isn't it cute? 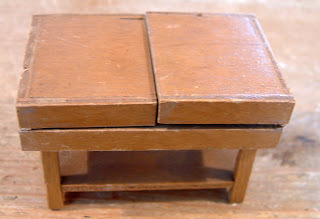 Although Strombecker furniture seems to be quite prevalent over in the States, we don't see it in abundance over here. 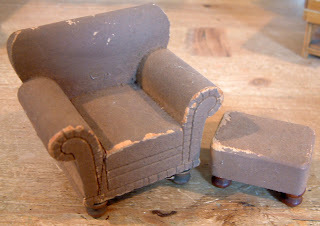 I do love this particular armchair and footstool though...so very 1930s in style! Forget the slight worn patches...just like a real armchair, one can always cover with a throw if one so wishes! Then there is this rather odd antique tin item. 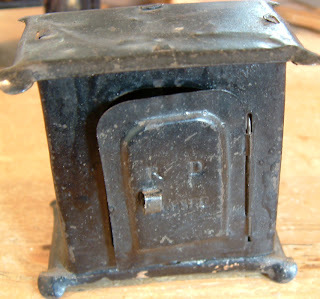 I have listed it as a tin cupboard however am not entirely convinced as it could be a safe or an old fashione stove even? It does have an opening door with RD and a number embossed into it. 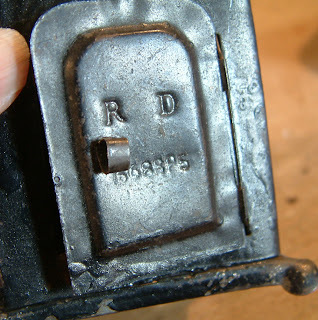 Does anyone know what manufacturer's name the RD stands for? These three items can be found on the Antique 12th Living Room Page. ...there is this rather lovely wooden cutlery table. It is believed to be Late Victorian/Early Edwardian. 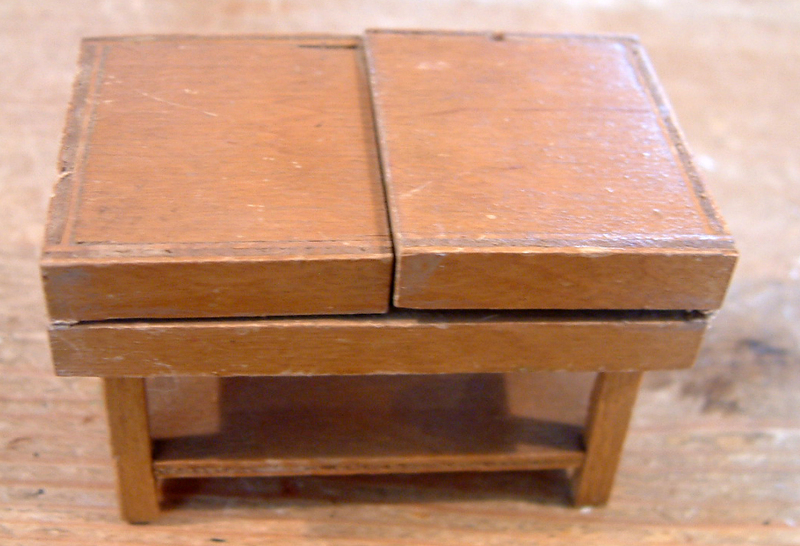 The table top opens out in two halves to reveal the cutlery tray and has a shelf underneath. 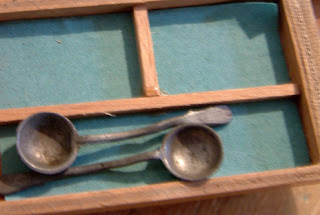 I have included two antique spoons with it. The Little Cardboard Box Project....Part Two! For those of you following this project, I am pleased to say that I have been able to do a little more and it has progressed! Am thoroughly enjoying working on it as I've complete freedom to take it into any direction that I wish as long as the concept of this scene is kept in mind.....which if you've read the previous posting, will see that it's based on my favourite nursery rhyme - Twinkle Twinkle Little Star. 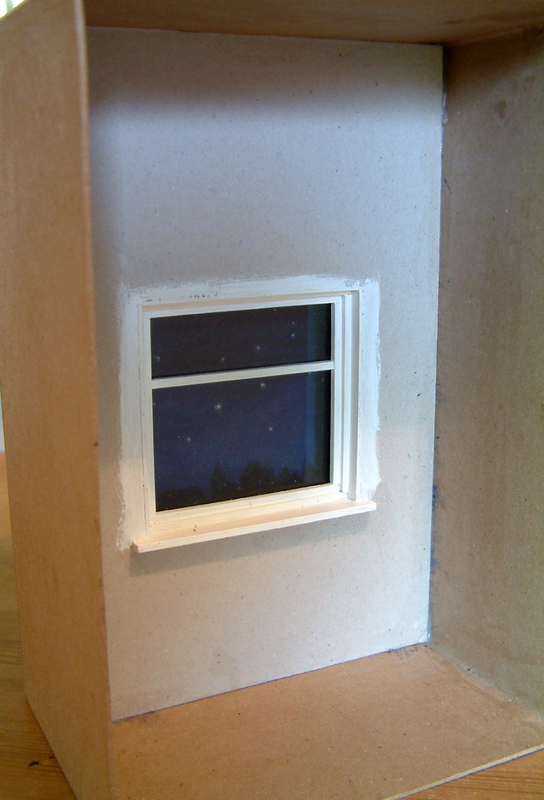 The focus of this project has to be the view of the night sky through the window. 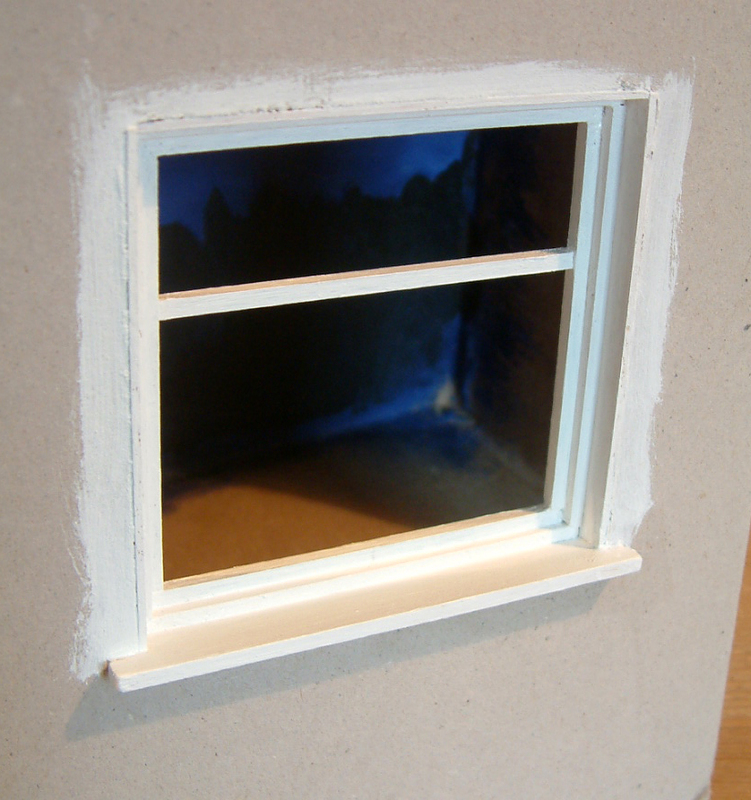 Originally I'd planned to create a large Victorian sash window but eventually decided that it would block out too much of the sky behind.....so I plumped for a simple framed window with a mock opening window at the top. 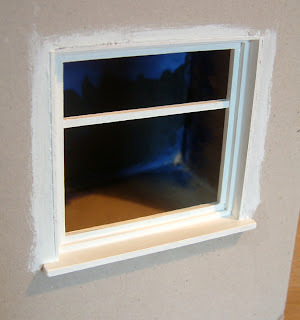 This kind of window is a simple process, particularly as much of the construction is hidden on the rear side of the wall and remains unseen. Spare offcuts from my "bits box" were used for the construction. On the rear of the wall, wooden supports were glued around each side of window edge from oddments. 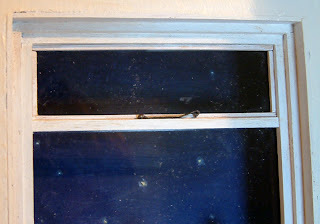 The sill was created from a 1/8" x 1" length cut wider than the actual hole and trimmed each end so that it sat snugly on the bottom edge of the window, plus the front edge protruded over the front edge by approx. 1/4". 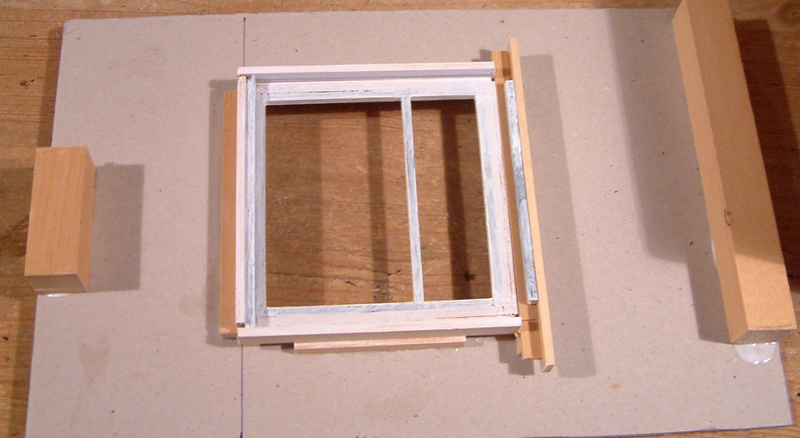 The two sides and top of the window were framed with oddments of 1/16" x 1/2" wood. 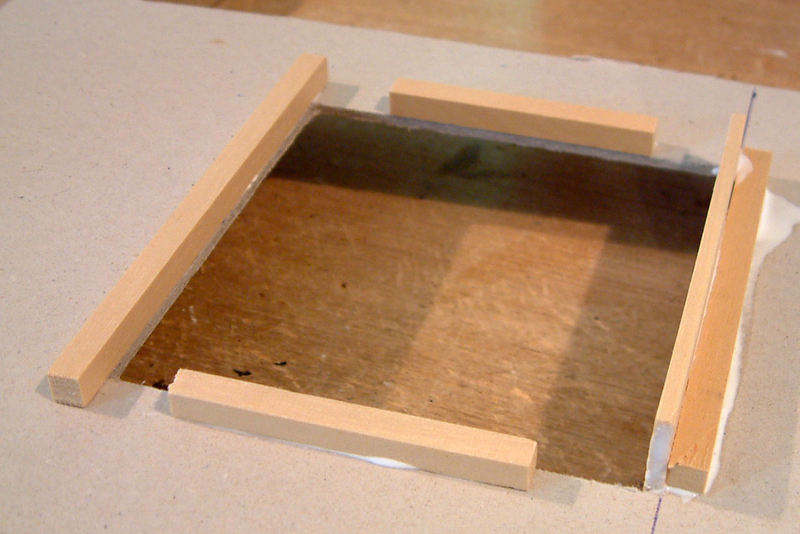 Next an interior frame made from 1/4"x 1/8" was created and fixed flush with the back of the outer frame. Then an inner frame was constructed from 1/8" x 1/8" wood pre-painted in brown which were actually leftover from a previous project. 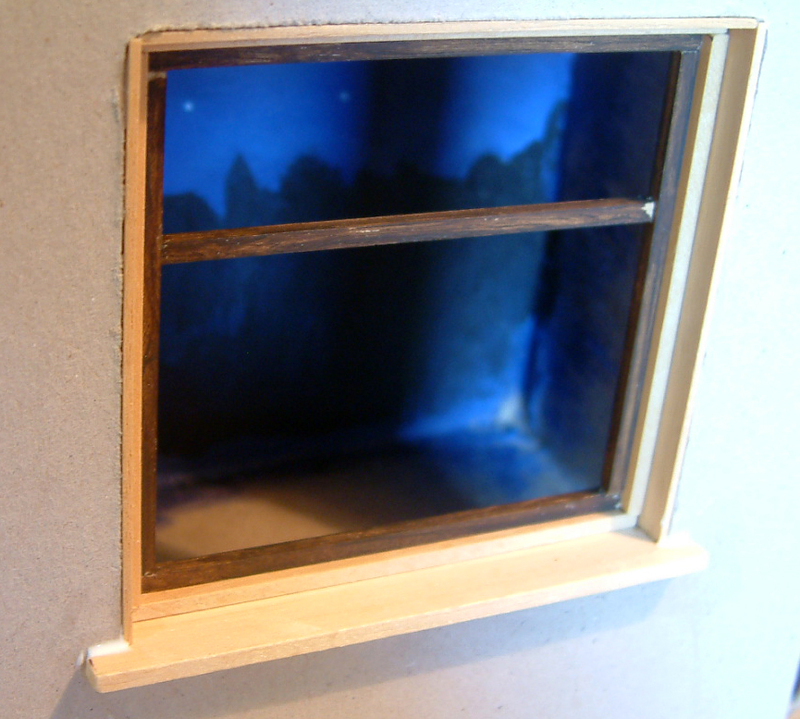 A bar to fit across was also cut and glued into place to give the illusion of a long upper window and lower window as seen in pic above. The entire frame was painted in white acrylic-front, back and inside. 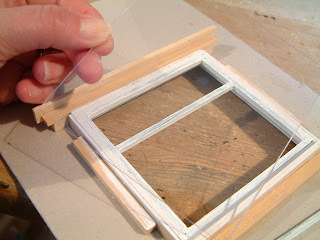 Then additional oddments of wood were added around the back of the frame in order to contain the clear plastic....(stiff plastic from any packaging will do). 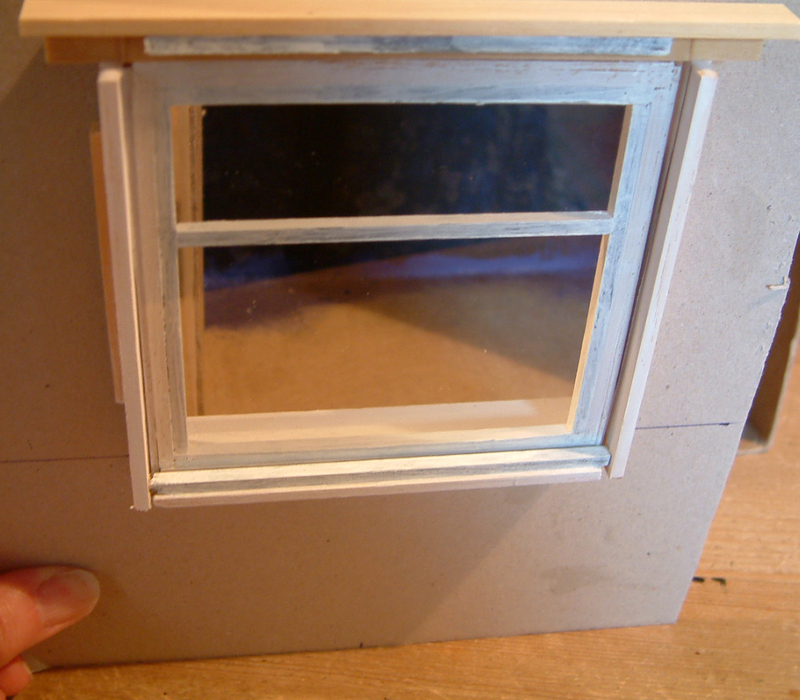 The plastic is then set over the rear of the window. 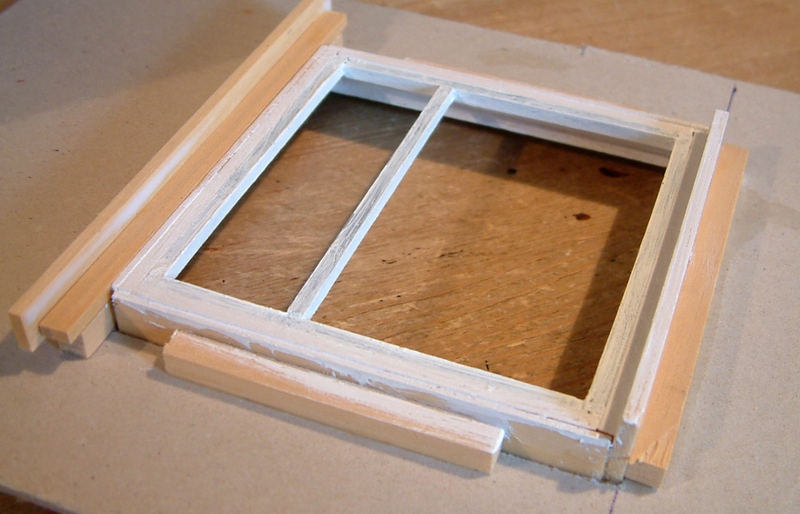 To keep the plastic firmly in place, pre-painted long white supporting struts (made from 1/8" x 1/8" wood) are glued along the top and bottom. 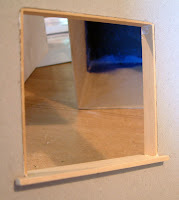 Next, supporting batons were glued at a depth of 1 1/4" from the back, plus additional oddments of wood were glued to top and bottom of rear wall....then the wall was glued into place. A strip of grey cardboard was cut the width of the box and 3 1/2" deep then glued at an angle to create a slanted ceiling...just to give a little more interest. 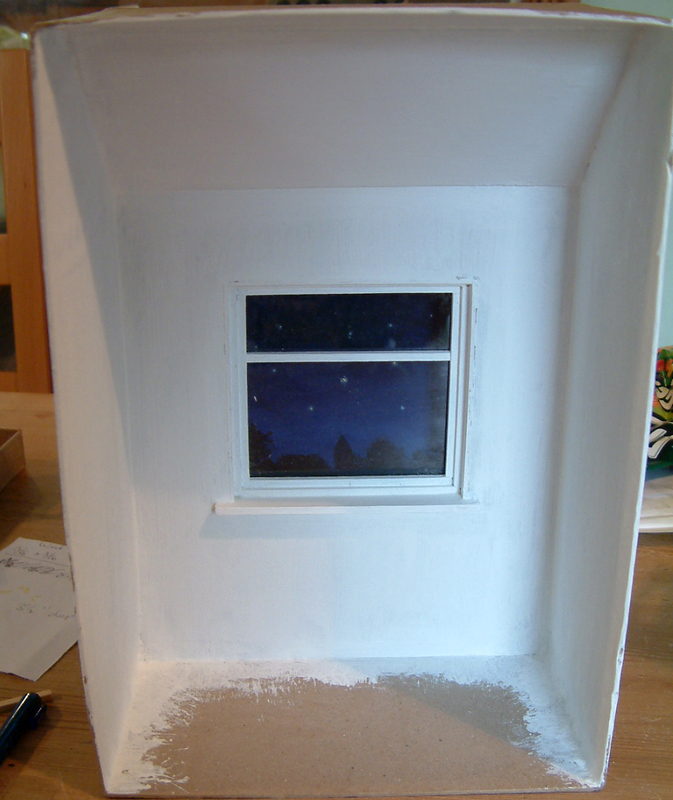 The ceiling and walls were thoroughly covered with quick drying acrylic primer, then the walls were painted in some very pale yellow emulsion that I had knocking around my workroom. Here is the room with just one coat of yellow.....and that is as far as I've got. Followers of KT Miniatures will know that I'm not one for pristine walls and am itching to get cracking on the aging bit but this will have to be it for now. 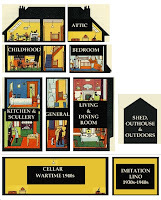 Although I hope to make most of the interior furnishings myself including bed...am off to Kensington Dolls House Fair in London tomorrow as a visitor...and I may treat myself to something......we shall see. I have just embarked on another little scene for our local miniatures' club main project, and like the attic scene which I featured on KT Miniatues Journal in it's various stages (a while ago now)....I will do the same too with this project and hope that it may inspire! 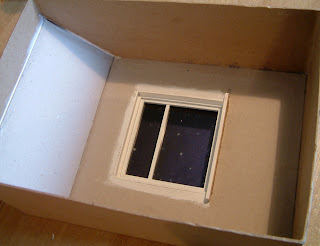 As club members, we have a choice of making a miniature scene inside a cardboard box based on "A Childhood Memory" or "A Nursery Rhyme" in any scale. I should have started this over 2 months ago but never seemed to find the time somehow, then with yet another club meeting looming next week, it was time to get cracking on this! Much pondering took place on my part as I found it difficult to formulate an idea on quite what to do. 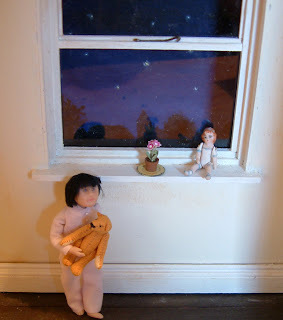 I eventually found on the internet, several vintage children's book illustrations of children sitting in various poses in front of a window looking out onto a night sky and it was those that finally gave me the inspiration needed! Haha....can you guess what scene I am making? 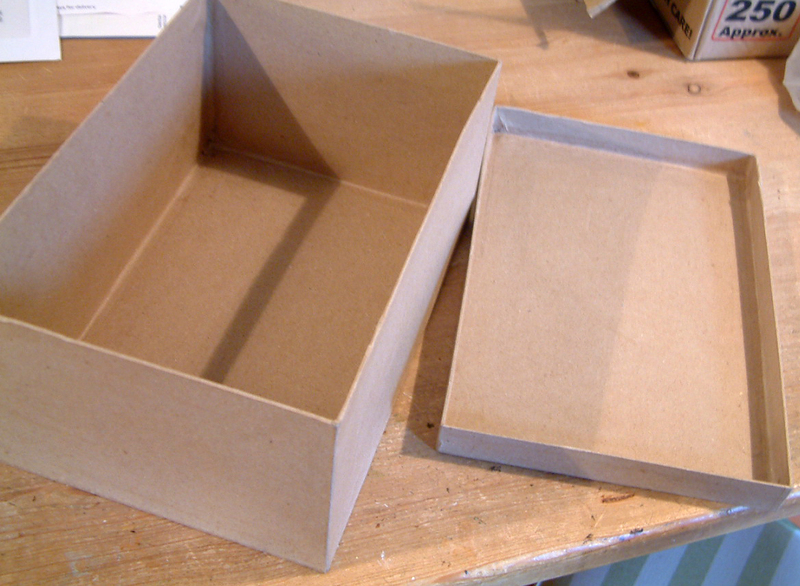 I 'd hoped to use a vintage cardboard box but simply could not lay my hands on one of the right dimensions. 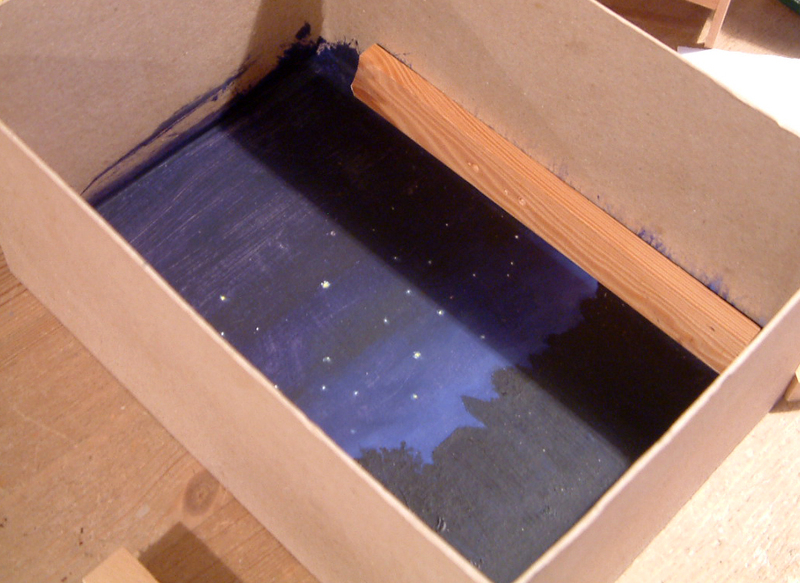 Similarly a shoebox was an obvious choice but again, none that I had were of the right dimensions needed so I ended up buying a sturdy box from my local art and craft shop (it was not expensive and saved me loads of time from actually making one from mount board-which was to be my last resort). This one measures 11" high x 7 1/2" wide x 5 1/2" deep. Then it was time to get my paints out and create a backdrop of a night sky with an outline of rooftops and trees etc. 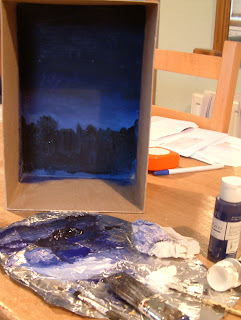 After painting the whole of the back in a deep blue acrylic, I then embarked on painting layers of various shades of blue with darkest at the top (with addition of black) and lightest at the bottom (with addition of white). 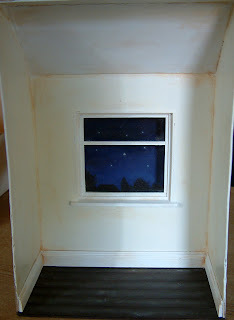 This backdrop is to be ultimately viewed through a window of a bedroom wall, so I needed to work out exactly where the window would be set and which part of the backdrop would be seen. 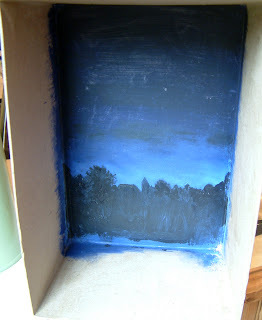 Then, using a small brush, painted freehand with black paint an horizon line of trees, rooftops and even a church steeple!! Using a finger, I added a highlight of pale blue arournd the horizon line ie. 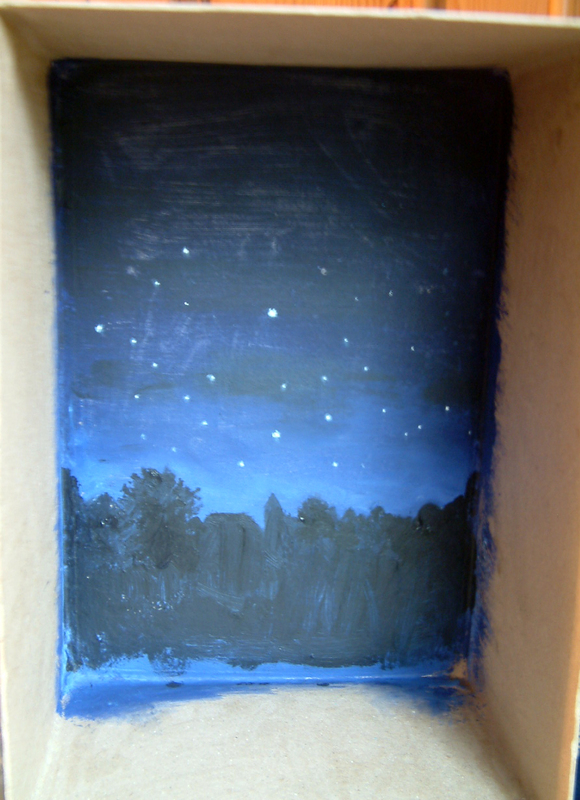 around the trees, rooftops etc., just to give added depth...was quite pleased with the effect. Have you guessed what this scene will be about yet? 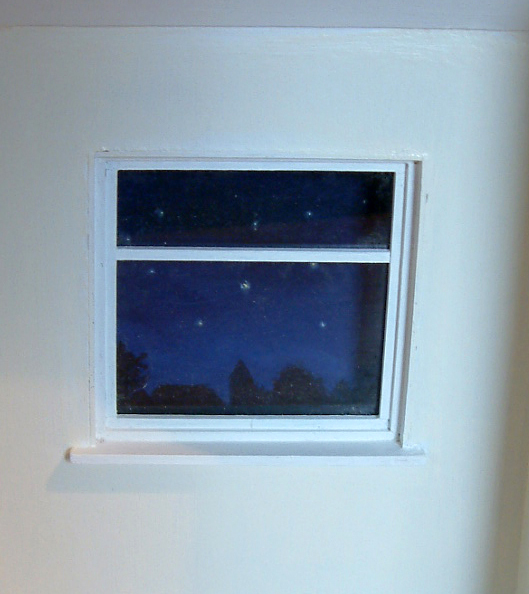 Once all paint had dried, with a very fine brush, painted randomly lots of white stars in the night's sky! 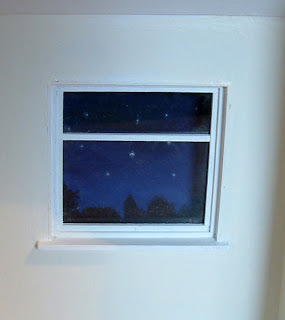 I found that once the fine white dot of a star dried, that if I splodged it very lightly again with well diluted white paint, it gave a kind of fuzzy effect that when viewed from a short distance away looked quite effective and...twinkly! Yep...the title of this scene is going to be TWINKLE TWINKLE LITTLE STAR.....one of my most favourite nursery rhymes of all time! . A bedroom wall was cut out of thick grey cardboard, then a 4" x 4" window was cut 3" up from the base. 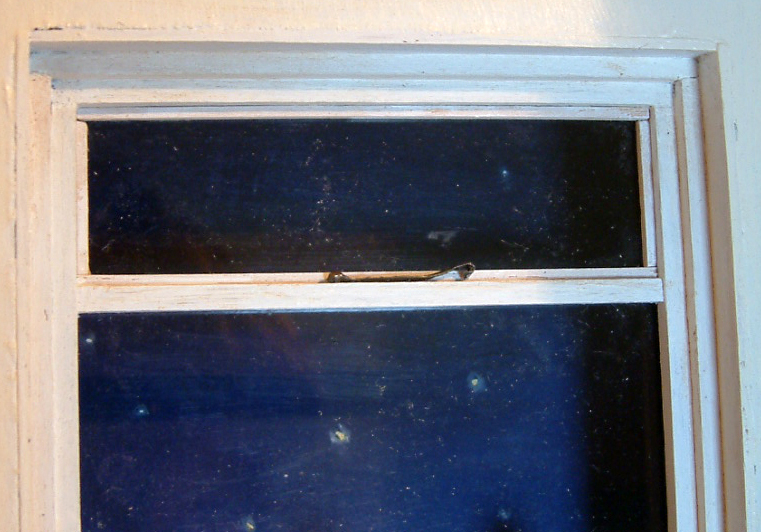 I will be making up my own window from oddments of wood so was free to have the window whatever size I wished. The wall will eventually be glued in at a distance from the backdrop but for now.....that will have to wait for another day. Hope you are enjoying it so far! 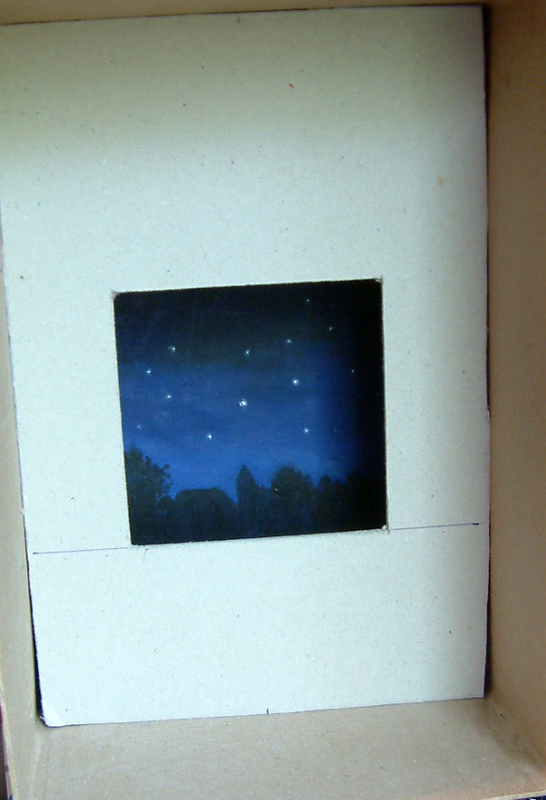 Labels: Miniature Scene In Cardboard Box, Twinkle Twinkle Little Star.